What’s on this Tornado Chaser site? Tornado chaser and storm chasing facts along and information about Tornado Alley can be found here. Here you can read exciting tornado chasing stories of Tornado Tim and view storm chase photos and tornado videos. Many dream of becoming a tornado chaser and chasing tornadoes. Storm chasing has become a hobby for many since the movie Twister came out. While it is something most people can learn to do, it is very dangerous. Even highly experienced storm chasers have been killed chasing tornadoes, so don’t take it lightly. Never chase storms unless you are very sure you know what you are doing. How does a tornado form? 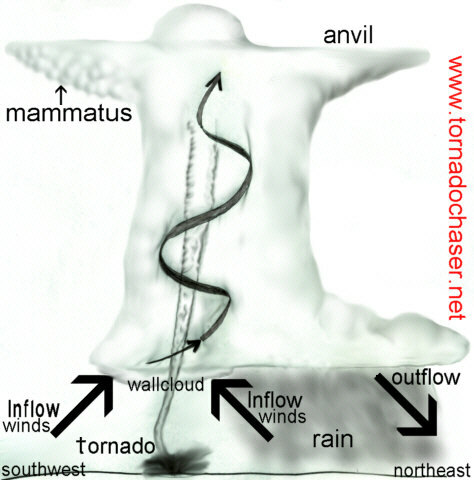 There is still much we don’t know about tornadoes, but this gives you a good idea of how they might form under these conditions. Warm moist air shoots upward meeting colder, dryer air. Warm moist air is lighter than the cold dry air making for a strong updraft within the thunderstorm. As the warm moist air rises, it may meet varying wind directions at different altitudes. Read all about Learn about wind shear by clicking here. If these varying winds are staggered in just the right manner with sufficient speed, they will act on the upward rising air, spinning it like a top. This would be similar to spinning a pencil held between your hands with your palms facing each other, moving your hands in opposite directions. The storm will begin to show visible rotation, often forming a wall cloud. Inside the storm these spinning winds can begin the formation of a tornado. On the outside of the thunderstorm rotation might be visible. 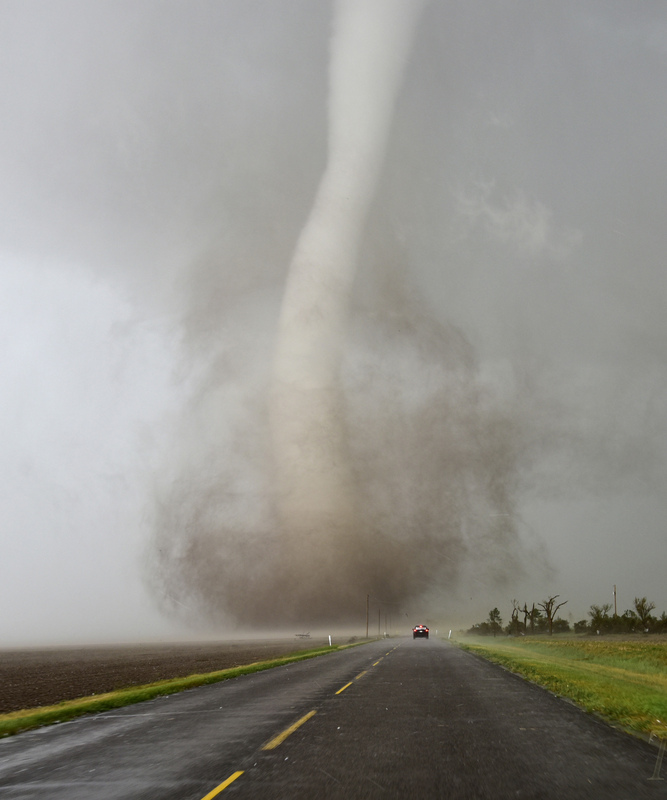 Only about 30 percent of mesocyclones actually produce a tornado, but about 95 percent produce severe weather. 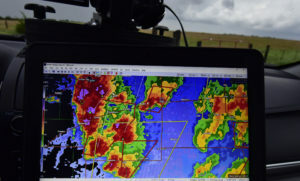 Most of our information about the inside of a tornado-generating thunderstorm comes from data gathered by Doppler radar. 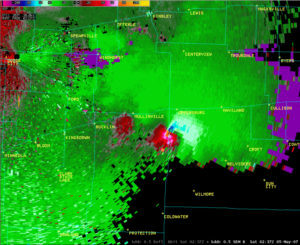 This doppler radar image is from the EF5 tornado that destroyed the city of Greensburg Kansas. The illustration below would be an example of how a tornado would typically form in this type of thunderstorm. What makes a tornadic thunderstorm more severe than an ordinary thunderstorm? Much of the difference is located inside the storm, and what the winds affecting the storm are like. In your everyday thunderstorm you have the warm moist air rising causing updrafts within the storm, and colder air descending causing downdrafts. Typically these thunderstorm downdrafts will be separate from the downdrafts caused by the rain falling. Rain causes a downdraft because it is cooler than the warm rising air. As an ordinary thunderstorm matures the falling rain cause more down drafts, and finally begins to negatively affect the updraft that builds the storm. This would cause a typical thunderstorm to weaken, less updraft, less power. But in a severe thunderstorm the downdrafts may be so strong that they pull the moisture or falling rain into them further strengthening the down drafts. As these down-drafts intensify, they can actually act like a wedge increasing the intensity of the updraft. These updrafts can get so strong they even intrude into the stable stratosphere. When a storm updraft breaks into the stratosphere this condition may be referred to as overshooting. When updrafts are this strong it becomes possible to suspend hail for long periods of time further adding moisture to the hail, sometimes building it to incredible sizes. 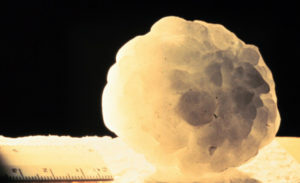 Grapefruit sized hail is possible within severe storms and as a storm chaser these are a nightmare because they will knock out all your car windows. In a severe thunderstorm the down-drafts and updrafts actually feed each other giving the storm a life of its own. Whereas an ordinary thunderstorm might only last 30 minutes to an hour a severe thunderstorm self generates its life so that it may last several hours or more. Severe storms produce downdrafts that can get very strong causing a microburst. These can be as damaging as an f1 tornado, toppling mobile homes, knocking down trees, damaging buildings and more. As a storm chaser I have seen many of these intense microbursts. 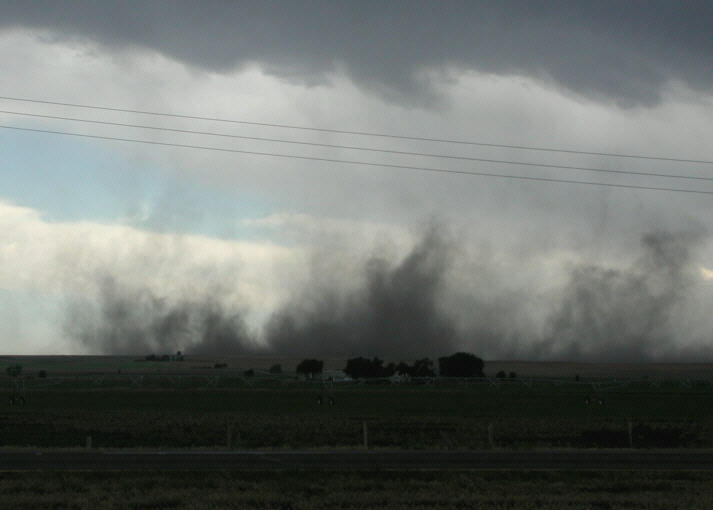 Many times the damage caused from a microburst is mistakenly thought to have been by a tornado. This is because the damage they leave can be so severe it looks like a tornado hit. But the damage path from a microburst is unidirectional, leaving a straight-line path of destruction, whereas a tornado spreads debris all directions and leaves a circular path of destruction. This is why the National Weather Service conducts inspections of the damage from severe storms, to determine the cause of the destruction. People in mobile homes should understand this because it may save their life. Even if there aren’t any tornado watches or tornado warnings issued, if a microburst hits your mobile home it can pickup your mobile home and topple it. You could be seriously injured or even killed by a microburst if you don’t have adequate shelter. So when the National Weather Service issues a severe thunderstorm watch or warning, be on the lookout for down drafts, they can be dangerous. Besides dangerous downdrafts and powerful updrafts, a severe thunderstorm usually is acted on by strong wind sheer, winds changing speed and direction with height. These winds act on the updrafts and down drafts causing the entire storm to develop strong rotation. This rotation is visible by Doppler radar. Putting all these ingredients together makes for a dangerous thunderstorm. A thunderstorm is classified as a mesocyclone when cyclonically rotating air is detected within it as it can be seen in this time lapse video by clicking here. The National Weather Service uses Doppler radar to detect this rotation so it can keep the public apprised of the severity of the storm. 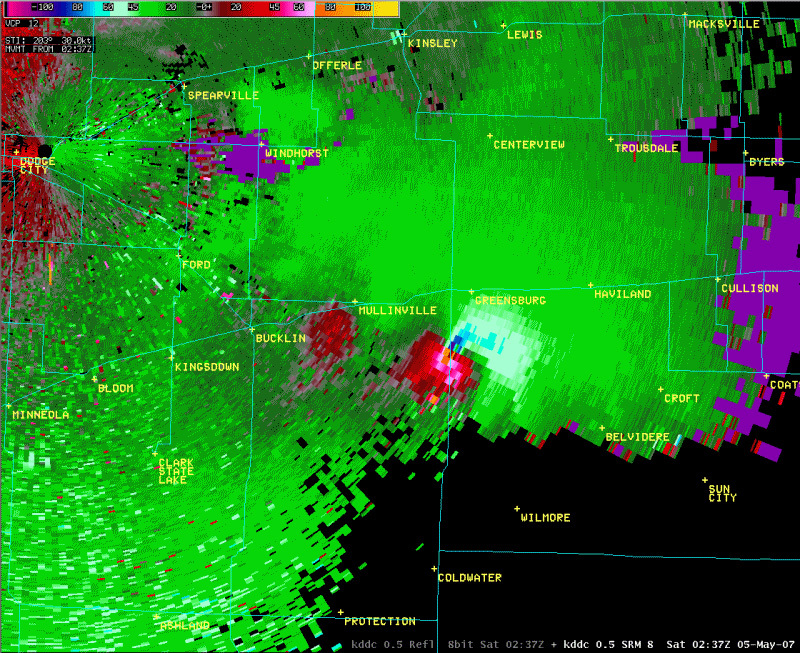 Doppler radar is also used to see into the rotation of the storm looking for a tornado signature. A tornado signature or tornado vortex signature shows up as an area within the storm with rapidly changing wind directions. This is used to issue a tornado warning for people in the path of the storm often well before the tornado is even on the ground saving many lives every year. Don’t forget to read Tornado Tim’s newest book. See below.